The final leg of my three-weekends-in-a-row travel extravaganza was a Friday to Monday trip out to Ireland. I had mixed feelings about this trip from the very beginning, partly because I was getting a bit burnt out from all the travel and partly because I had heard that Dublin wasn’t all that great of a city. But I had a friend out in Galway I wanted to visit (Eilish! ), so decided to organize my trip so the bulk of my time would be spent outside of Dublin. The flight over was uneventful, featuring another exciting trip out to the mysterious Frankfurt Hahn airport to experience the wonders of flying budget airlines. We got into Dublin around 8 p.m. and didn’t get into the city proper until close to nine. This put us in a bit of a bind, because we all were starving, but apparently most pubs in the city stop serving food after 9 p.m. Tired and hungry, we decided to swallow our pride and go somewhere we knew was still serving food and where we knew we could find something we’d want: TGI Fridays. Not our finest moment (14 euros for chicken fingers? Really? ), but at least our hunger was sated. After eating and dropping our stuff off at the hostel, it was about 11 p.m. We were all tuckered out but unwilling to go to bed without sampling at least a little bit of Dublin nightlife, so we wandered over to the Bleeding Horse Pub for a nightcap. It was a pretty cool pub – very loud and lively inside, with a trendy décor. We quickly realized, however, that everything—not just your TGI Friday’s chicken fingers—was expensive in Ireland. Many of the beers cost more that 5 euros ($7)! For a pint! Compare that to 2 – 3.50 euros for a half-liter in Marburg. Yikes! So we sipped our pricey beers, enjoyed the loud music and general chatter, and then slipped off to bed. The next morning, I caught a 10 a.m. bus to Galway to visit Eilish. I used the 20-minute or so walk over as a chance to see some more of Dublin, and overall I just wasn’t impressed. Granted, I was seeing it at about 9 a.m. on a Saturday morning, so not exactly the time when Dublin comes alive, but I just didn’t find the city very pretty or inspiring. I’ve seen Paris and Munich and Budapest and Salzburg and, well… Dublin just didn’t seem that special. I was also surprised and annoyed at how hard it was to find a simple café on my way over where I could pick up a fresh-baked pastry and maybe a hot chocolate. Many places advertised themselves as cafes, but when you went it, it be more of a convenience store with some baskets of croissants or donuts whose freshness was suspect. Color me unimpressed. The busride to Galway took about 2 ½ hours – it’s a harbor town on the other side of Ireland. In many ways it’s not unlike Marburg – a small town that thrives on a significant university student population. Eilish picked me up at the bus station, I dropped my stuff off at her apartment, and then she took me on a tour of the town. 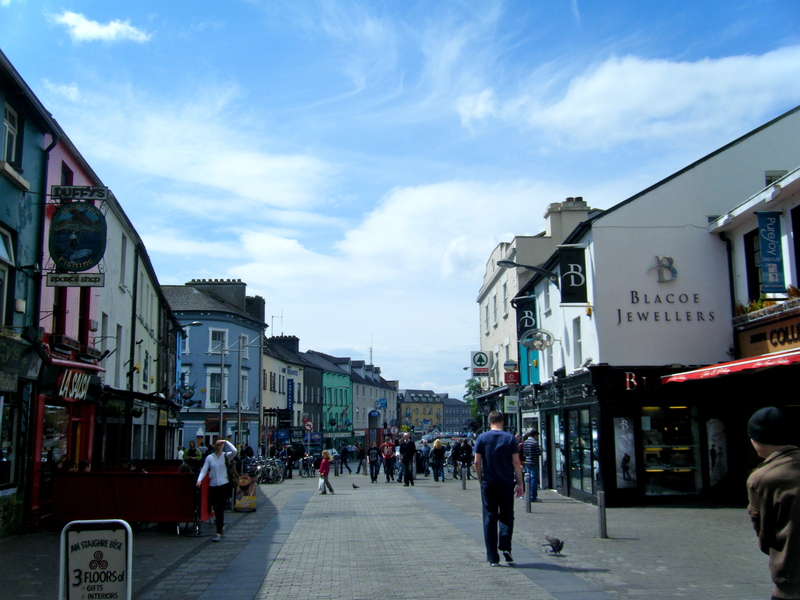 I was immediately smitten with Galway in a way that I had not been in Dublin. The best word I can think of is charming—lots of cute shops, friendly people and interesting bits of history. After walking a bit we hopped on a boat to take a cruise on the River Corrib, which offered me the chance to see more of the Irish landscape as well as some bits of historical significance in the form of castle ruins and other abandoned structures. That night, Eilish took me out to one of her favorite pubs. The entire experience was just wonderful. The pub was fairly small but quite packed. There was a traditional Irish band playing in the corner, and people would occasionally attempt to dance in what little space they could find. I was also amazed at how friendly people were, and how willing they were to talk to strangers. Eilish and I talked for a bit with a few Irish guys who began the conversation by complimenting us on our drinking Guinness (“You look like real Irish women!”). The whole atmosphere was just so warm and convivial. It was unlike anything I had experienced in my travels. The next day, Eilish and I hopped on a tour bus that would take us around several points of interest in the surrounding area, including the much-hyped Cliffs of Moher. It was my first experience doing any sort of organized tour, and I wasn’t sure if I would like it, but overall it was a very positive experience—certainly an efficient way to see a lot in just a day. The only downside was that there were many times I wish we could have just pulled over and stopped to admire the view. It would definitely be nice to do a tour of the Irish countryside by car some day. 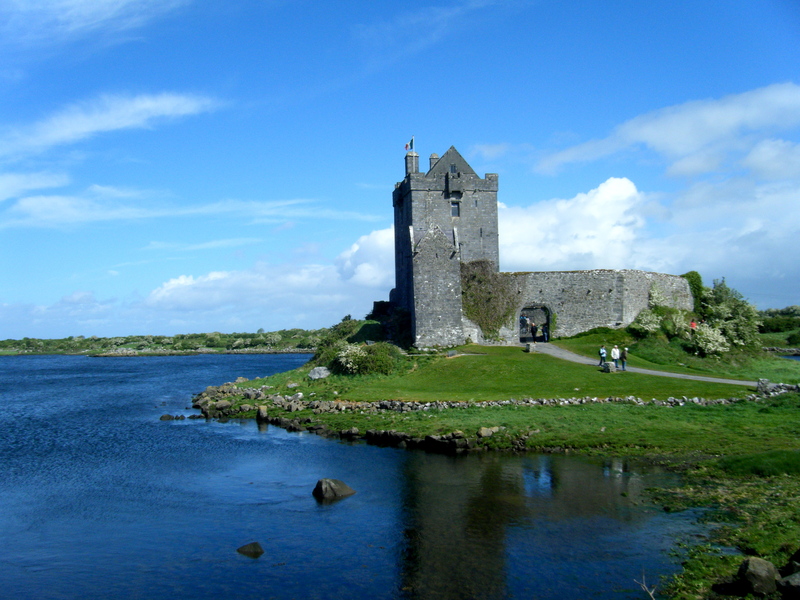 The tour took us to the lovely Dunguaire Castle, situated on a placid lake and then to a fairy fort, basically a ring of trees with a grassy clearing in the center. It’s actual purpose is unknown, but was probably either used for farming or ritual purposes thousands of years ago. From there we wound our way up to the Burren, which is a hilly, barren part of the country. The landscape was very interesting, much of it being very rocky and somewhat treacherous to walk on. Our main stop here was a portal tomb, an ancient tomb marked by massive stone slabs. I thought this was totally cool, unlike anything I had seen so far in Europe. We had about an hour stopover in Doolin for lunch, one of the adorable small towns that, as far as I can tell, pretty much dominate the Irish countryside. Then it was on to the main event, the Cliffs of Moher. The Cliffs were the one thing I knew I absolutely had to do in Ireland. I had heard so much about their epic beauty. I prayed that the volatile Irish weather would be kind to us for just forty minutes, and thankfully it was cooperative, at least as much as could be expected. 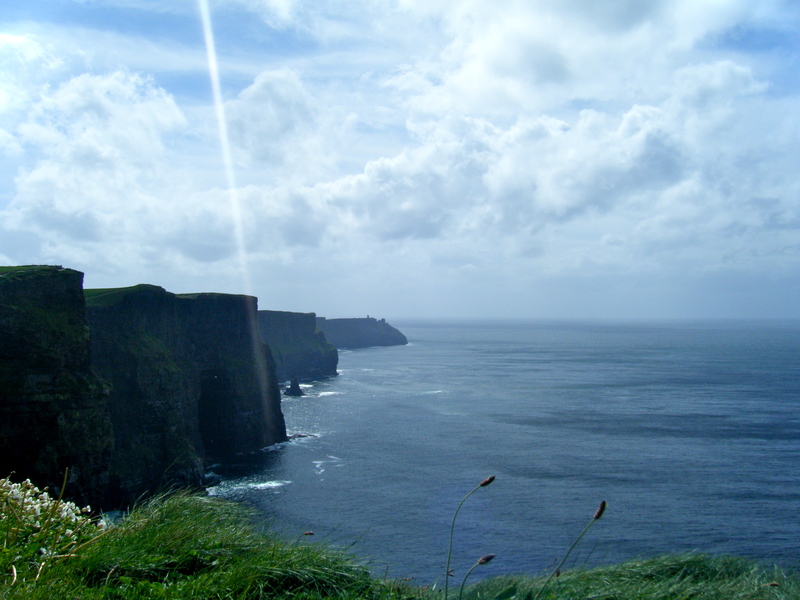 The sun was shining beautifully on the cliffs, though the wind was incredible. Honest to god the most intense wind I had ever experienced, and anyone who has ever lived in Milwaukee knows that I have experienced some serious winds. But the cliffs provided an absolutely beautiful juxtaposition of lush, green countryside and deep, mesmerizing blue ocean. It’s easy to understand how so many before me have been captivated. We then wondered over to the visitors’ center, since we had tickets to the exhibit portion of it as part of our tour. The exhibit was interesting, but if our tickets hadn’t already been covered, I certainly wouldn’t have paid for it. The cliffs are enough of a treat in themselves. We also timed the weather perfectly, for as soon as we began to move into the visitors center the rains moved in. After the cliffs, our tour had one more stop along the seaside, to sort of offer a perspective on what the rest of the Irish coast looks like. I thought it was as beautiful as the cliffs, just in a different way. It was not unlike the coasts in the Pacific Northwest—very rugged, with high waves crashing against the rocks. I really fell in love with the Irish countryside during my trip. In every way that Dublin unimpressed me, the countryside rose to the occasion. It was beautiful in a way I was not used to experiencing—I’m used to the mountainous, forested beauty of the Pacific Northwest, or the medieval beauty of Germany, or the architectural beauty of places like Paris and Salzburg. The Irish countryside was none of this—just rolling, verdant fields or pleasant woods. But there was such a simple beauty in all of this, and such a kindness in the people, that I couldn’t help but be won over. The next day, Monday, I headed back to Dublin with the rest of my group. I had originally thought that I would use this day to do some proper sightseeing of Dublin, but they had already done most of their major sightseeing and I just wasn’t feeling a strong desire to explore the city. We walked around a bit, seeing St. Stephen’s Green, Trinity College and some other parts of the city, but I ultimately was not won over. However, the adventure didn’t end in Dublin. You see, getting back to Marburg was going to be quite the ordeal, because after we booked our flights, RyanAir changed the departure time of our flight back to Frankfurt so that we would be getting into Frankfurt Hahn around 11 p.m. This was problematic because it meant that by the time we reached the train station in Frankfurt, we would miss the last train back to Marburg and have to wait until the first morning train the next day. Oh boy. So we got into Frankfurt Hahn right on time, around 11:10 p.m. We then waited around the airport until 12:30 a.m., when we caught a bus that would take us back to the train station in Frankfurt. We could have taken an earlier bus, but given the choice between loitering in the clean, safe Frankfurt Hahn Airport and loitering in the shady, unclean Frankfurt Hauptbahnhof, we chose to maximize our time in Hahn. We arrived at the Hauptbahnhof, chipper and alert, around 2:15 a.m. When we went to enter the train station, not wanting to wait around with Frankfurt’s finest citizens outside, we found that all the doors were locked. Uh-oh. We walked around to the front of the train station and saw several security officers loitering outside of it. Still in a sleepy stupor, I attempted to speak to them in German, and thankfully was coherent enough to explain we had just arrived from Hahn and that we were taking an early morning train to Marburg. This was enough for them to let us in – after we were in we realized we were thankful that they were being more discriminating about who was actually getting into the train station at these hours. So then we sat for three hours, trying to fight the mind-numbing boredom. At 5:21 a.m., we hopped a train to Marburg, and around 6:45 a.m. we finally arrived at our dorms, a mere 12 hours after we left Dublin. The things you do for a cheap flight! I’m so glad you had fun in Ireland! It’s crazy to think I was JUST there and so you’re talking about doing all these things that I just did. So much fun. I, too, was unimpressed by Dublin. We had some decent food there, and I enjoyed the historical sights (Kilmainham Gaol, Trinity College, the GPO), but other than that… Galway is my favorite and I’d go back in a heartbeat. You were lucky to know someone there. Next time I see you we should share Galway stories; I miss it already! Glad to hear you’re having a wonderful time abroad. Miss you! Man Bunbun, I could die of jealousy. I was so in love with the Burren when I was there, absolutely in love. I agree with Deanie though– there are some cool things to do in Dublin, like Kilhilmainham and the Book of Kells, but the Irish countryside is really where it’s at! Too bad you didn’t get a chance to go to Blarney or Cork, although that’s a lot of traveling for one weekend. Love you much! Can’t wait to see you once you’re back in the boring old Midwest.